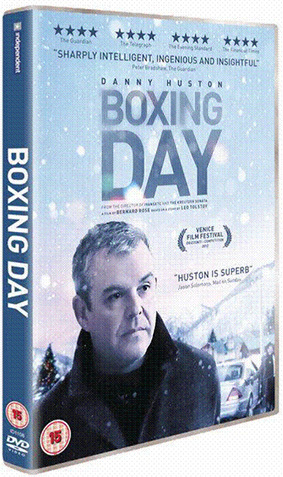 Basil (Danny Huston) leaves his family on Boxing Day to pursue a lucrative property deal in Colorado. He hires local chauffeur Nick (Matthew Jacobs) to drive him into the heart of the Rocky Mountains. The men's backgrounds are as different as their points of view: Basil, the shrewd and abrupt American businessman pitched against his charming and recently divorced English driver. But as the evening sets in, the growing menace of the elements leaves the men with no choice but to work together if they are to survive the night. From the director of Candyman and Immortal Beloved comes Boxing Day, a powerful tale that delves into the heart of the human condition. This modern day interpretation of Tolstoy's novella "Master and Man", follows Ivansxtc and The Kreutzer Sonata as the third film in Bernard Rose's series of Tolstoy adaptations. Described as "Sharply intelligent, ingenious and insightful" by The Guardian and a "terrific, gallows-witty drama" by The Telegraph, Boxing Day will be released on UK DVD on 25th March 2013 from Independent Distribution at the RRP of £15.99.